Zombie Peter Rabbit is Sugar Plum's classic white chocolate bunny with a twist! One Of A Kind: Made of white chocolate and designed to be a one-of-a-kind piece that will make kids and adults alike scream and start running for the hills, our Chocolate Zombie Bunny comes beautifully wrapped in cello bag with a festive bow and a gift tag. The Pros Know: In fact, we've recently been featured on Rachel Ray and Food Factory, and the Academy Awards wanted to know if we could include some of our deliciousness in their famous goody bags. 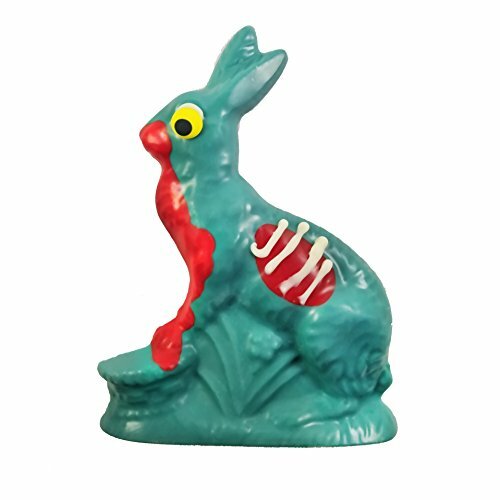 This Sugar Plum Chocolate's Zombie Bunny is your eminently fun gift that is guaranteed to bring smiles and laughs to your friends and family. At Sugar Plum Chocolates, we do chocolate and candy right by using nothing but the best ingredients perfectly combined into a chocolaty confection that you can enjoy to the max with minimum mess. Don't let Zombie Peter Rabbit hop...err...stagger away - order today! Comes with one 7.5oz Zombie Chocolate Bunny, victim bunny not included. MUST-HAVE ZOMBIE RABBIT: Our Zombie Peter Easter Rabbit is handcrafted with gourmet white chocolate by our very own Sugar Plum Chocolate Artisans. CHOCOLATE WITH A TWIST: Get creative with a Zombie bunny! Each Chocolate Zombie Bunny comes beautifully wrapped in cello bag with a festive bow and a gift tag. GIFT GIVING MADE EASY: Our Zombie Peter Rabbit is one-of-a-kind fun chocolate gift for Mother's Day! HANDMADE TO PERFECTION: At Sugar Plum, we have a blast pushing the boundaries of typical chocolate gifts and coming up with terrifically tasty treats that are made to perfection, every time.